Euchre needs no explanation to those who love it. Super Euchre! brings the magic of the game to life in your hand just like you were playing with your best friends. Nines and Tens, Ace No Face – your favorite game options are ready for you to play. 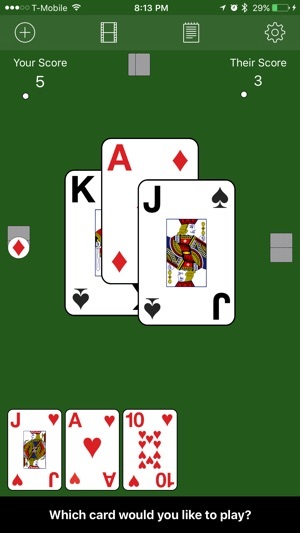 Waiting in a line, sitting on a train, plane, bus or just bored at work… you need Super Euchre! 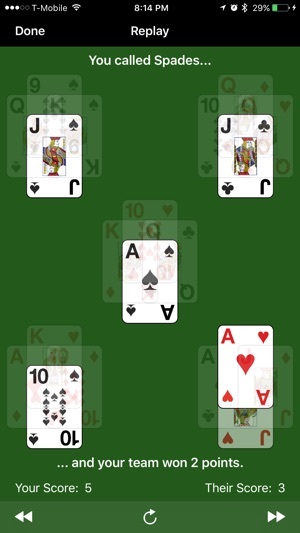 I’ve played just about every free euchre app and this one is the best of them. However, there are still some issues with this game. First off, your partner constantly makes incorrect moves. For example, if they call trump with the right bower, king and queen of trump, and two off suits, they will ALWAYS lead the low trump, lose the trick, then play the right bower to win the next trick. This causes us to lose hands, and even games, which is maddening. To be fair, your opponent will do this as well, causing you to win at times when you shouldn’t, but this is still something that shouldn’t happen. Secondly, the amount of times I call nines and tens and then receive either 2 or 3 nines and tens back does not make sense. Statistically speaking, the chances that I receive 5-6 of the 8 nines and tens multiple times in one game is theoretically 0, so the programmers need to work that out. 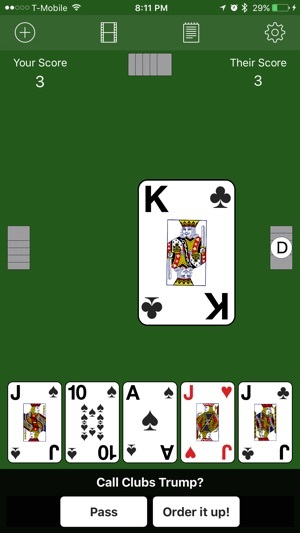 Overall, this is a good game, and the best free euchre app. 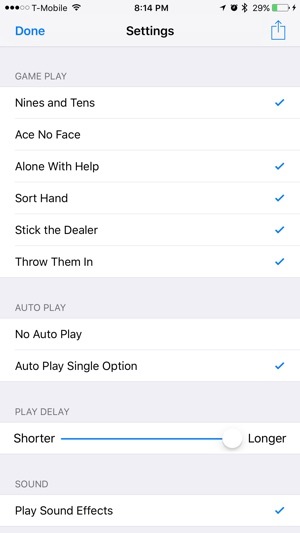 You can control speed of play, your partners “tendencies”, auto-play options, and different game rules. 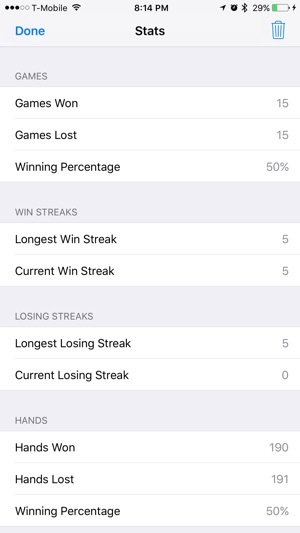 I just still get annoyed with my partner too often and it baffles me that in an app where you only play one game, the computer players play incorrectly, even after multiple updates. I first heard of Euchre when I was watching an episode of New Amsterdam. Chemo patients were playing it so I figured I’d download an app to learn too. I first downloaded a different app, with strong reviews. Fortunately, it introduce me to the game rules. Unfortunately, even in the slowest setting I found it confusing and it did not offer a replay. On several occasions I thought that the computer had chosen incorrectly, but I couldn’t verify it. I recently downloaded this app and I’m very happy with it. It consistently seems to follow the rules and makes sense. I certainly like that I can see a replay of any move I question. 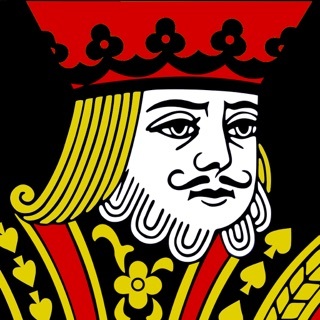 Having the both the trump Jack and same color Jack act as a Joker - both higher than an ace is a bit of a mind bender- making available replays more important than usually. Fun game! I realize that it’s a programmed set of instructions that the other “players” are using... but come on! When you have to sit out, due to your partner going alone, only for them to get euchred time and time again?! Also, when they don’t lay ace on your non-faced card, but instead lay off! Aside from very annoying playing habits of the computer generated partner, this game is pretty awesome. Ads are pretty easy to skip over and they only come up after a completed game. ☝🏼 dev request: remove the random AVAudioSession attempts! Or at least when there is a session active in another application 🎧 - 5 stars if you can make that happen in the next update!